Home > C++11	> Move Me, Please! UPDATE: Don’t read this post. It’s wrong, sort of 🙂 Actually, please do read it and then go read John’s comment below along with my reply to him. D’oh! Just because all the STL containers are “move enabled” in C++11, it doesn’t mean you get their increased performance for free when you use them as member variables in your own classes. You don’t. You still have to write your own “move” constructor and “move” assignment functions to obtain the superior performance provided by the STL containers. To illustrate my point, consider the code and associated console output for a typical run of that code below. As expected, we measured a big boost in performance, 5X in this case, by using “moves” instead of old-school “copies“. Having to wrap our args with std::move() to signal the compiler that we want a “move” instead of “copy” was well worth the effort, no? NOTE1: I ran the code in this post on my Win 8.1 Lenovo A-730 all-in-one desktop using GCC 4.8/MinGW and MSVC++13. I also ran it on the Coliru online compiler (GCC 4.8). All test runs yielded similar results. W00t! 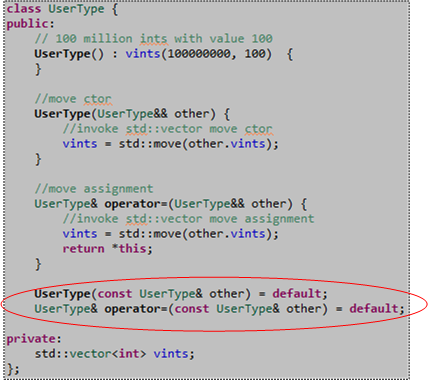 NOTE2: When I first wrote the “move” member functions for the UserType class, I forgot to wrap other.vints with the overhead-free std::move() function. Thus, I was scratching my (bald) head for a while because I didn’t know why I wasn’t getting any performance boost over the standard copy operations. D’oh! cout << "Time for move ctor + move assignment (micros) = "
cout << "Time for copy ctor + copy assignment (micros) = "
Your example UserType does not need to declare the move constructor/assignment operator. As long as you don’t declare a destructor or copy constructor/assignment operator, and your data members are all moveable, you will get the implicit move semantics. Sorrry, but I think you are wrong about the last part. 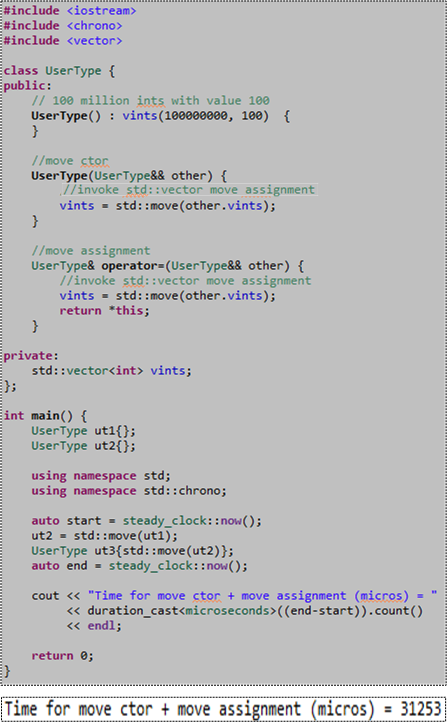 The compiler generated move operations will implement copies. I’ll test it out and update. Nope! You are right! UserType needs no explicitly defined move/copy operations. As long as the caller uses std::move(), the std::vector moves will get executed. Thanks for straightening me out.